Everyone desires a happy and healthy body. To obtain this, we need to strengthen and stretch to bring our bodies back to symmetry. Foam rolling rejuvenates the fascia, or tissue, that runs through the entire body. Resupplying oxygen and blood flow, this allows for a hydrated body with improved mobility. The following moves encourage fascia conditioning in a safe and simple way that can be practiced at home. First, take a tennis ball and place it under your foot closer towards your toes. Making sure not to lean into the opposing hip, start to roll the ball towards the heal of the foot to the desired intensity level. 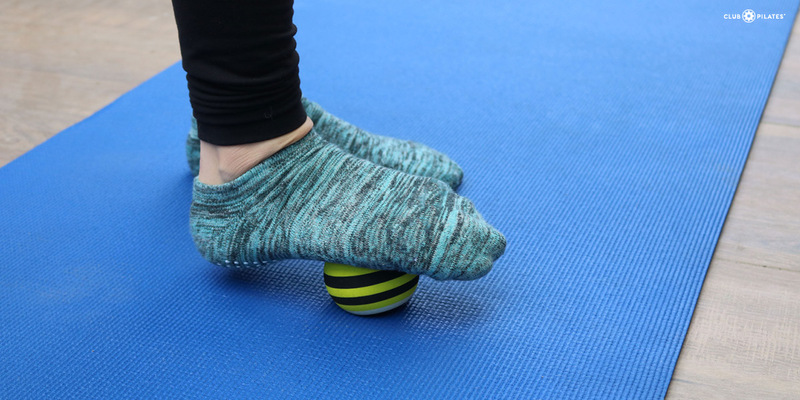 Do that about 4-5 times and then move the ball to the left and right side of the foot. Complete this one more time and only within the range where you feel pressure but never pain. The next move starts in a seated position placing either a foam roller, or tennis ball for more intensity, under the calf muscle almost down to the ankle. Have the opposing knee bent with the foot firmly on the floor. Place your hands on the floor slightly behind your hips to lift your body up and start to move the roller up towards the knee. Do that about 4-5 times to the desired intensity level and then switch the motion in a left and right direction. Complete this series twice making sure the shoulders are not elevated and the elbows are not locking. For a bit of extra pressure, you may cross your legs over the foam roller, as pictured above. Working up the body, the next move involves the quadriceps. Bring your body into a plank position with one leg bent at the knee turned outward. Place the foam roller under the straight leg just above the knee joint. In a forearm plank position, lift the body up and start to move the roller closer towards the hip. Do that 4-5 times, hold at your point of intensity, and then start to bend the knee on the same side as the foam roller into a hamstring curl position a few times. Repeat this series twice according to your individual level. For the next move, come seated with the foam roller or tennis ball underneath one side of your glutes. Start to roll forward and back or side-to-side until you find a tight spot. Then hold it on that area for a few seconds before switching to another tight spot. This helps re-oxygenate the fascia around the glutes down deeper towards the piriformis. Working up higher on the body, lie down on the foam roller so that it’s running left to right at the bottom of your shoulder blades. Start to roll up towards the top of the shoulders according to your body and then move slightly left and right. Do this a few times to work out the fascial lines around the trapezius muscle group on the back. In order to work out the tissue around the side body along the latissimus dorsi, lay on the foam roller so that it touches the posterior parts of your lowest ribs. Then start to move the roller up towards your shoulder joint. Once you find a spot with tightness, slightly swing the bottom arm up and down along the ground. This will help create mobility through the center of your body and increase blood flow. Finally, finish with a pectoral release to help regain posture. Take a tennis ball and hold onto it with both hands with fingers interlaced. Place the ball right by the shoulder joint on your chest. Start to move it in a circular motion locating areas of tightness around this muscle group. Hold the ball in place on any spot that has tightness, release after about 20-30 seconds, and then find another spot. Helping release tension throughout the body by doing some sort of fascial release allows for more mobility, increased blood flow, and more oxygen in the body. Always remember to breathe during every move to prevent strain and to decrease tension. Practicing these simple moves at home is a safe and functional way to bring your body back to symmetry by improving overall imbalances, preventing future injuries. Fascial release can help you return to a happier and healthier you! To learn more foam rolling moves and to feel the benefits for yourself, try a CP Restore class at your local Club Pilates!